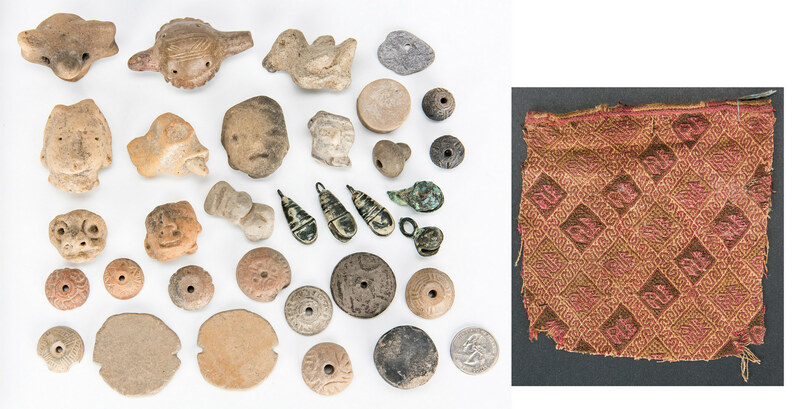 Thirty-three (33) Pre-Columbian/Mexican items, including pottery effigies, bells, and textile fragment. 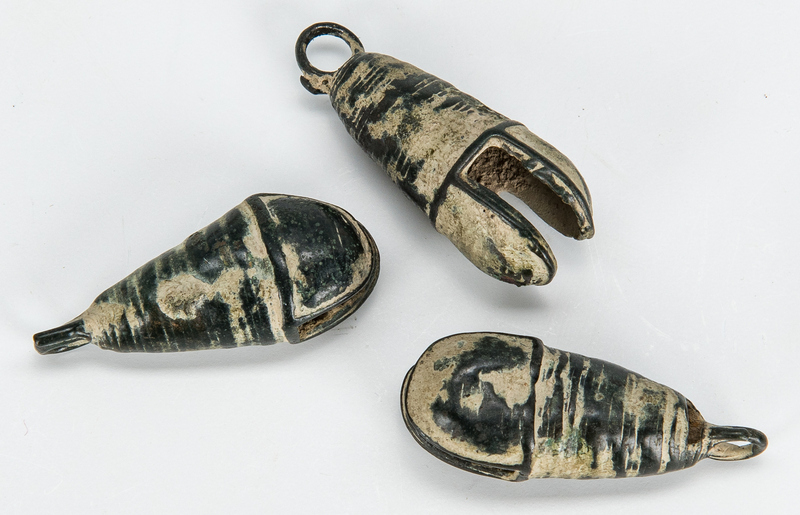 1st item: Huxtec, Mexico grey ware hollow pottery turtle effigy whistle with a parrot like head, rounded shell with incised lines to top and bottom with ridges at the side, the stem represented by the tail. Four small holes to top of body, one large hole to bottom of body. 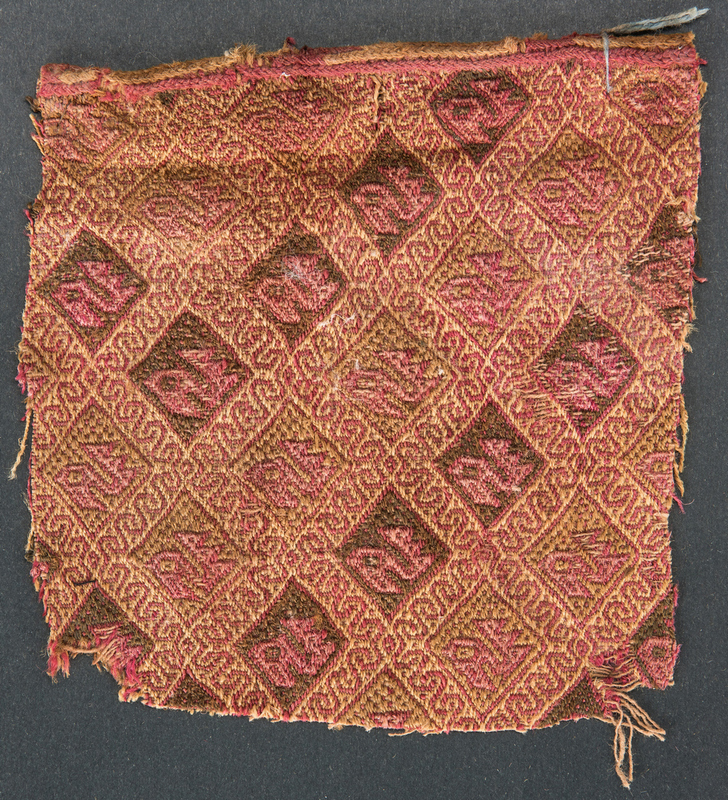 2 5/8" H x 1 1/2" W x 1" D. Circa 1000 AD. 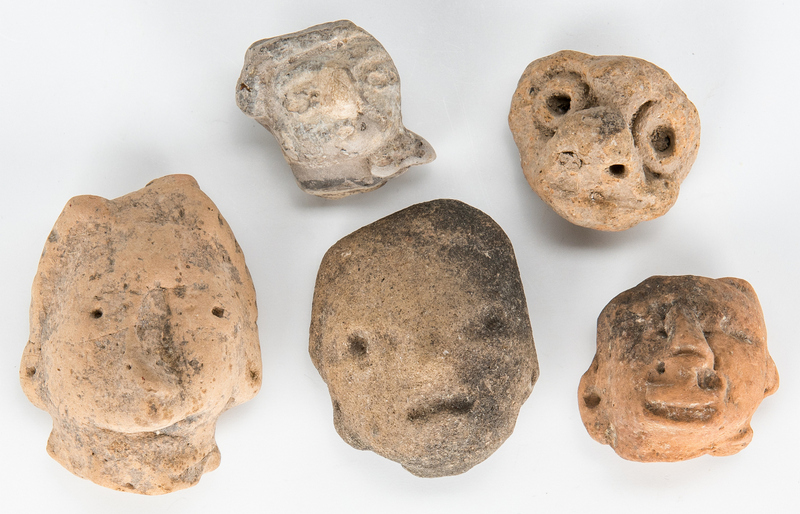 Note: Purchased from Ed Knight, Atlanta, GA. 2nd-10th items: Nine (9) pottery human and animal effigy head fragments, including a dog like head, an animal head with a large curved nose and bat like ears, and a bird. Ranging in size from 1" H x 1 1/4" W 1 1/2" H x 2 1/8" W. 11th-15th items: Five (5) bells of varying sizes, including one (1) San Gregorio, Michoacan, Mexico copper bell, three (3) silver bells with black paint, and one (1) copper bell with remnants of fabric at top. Both copper bells with clapper balls intact. 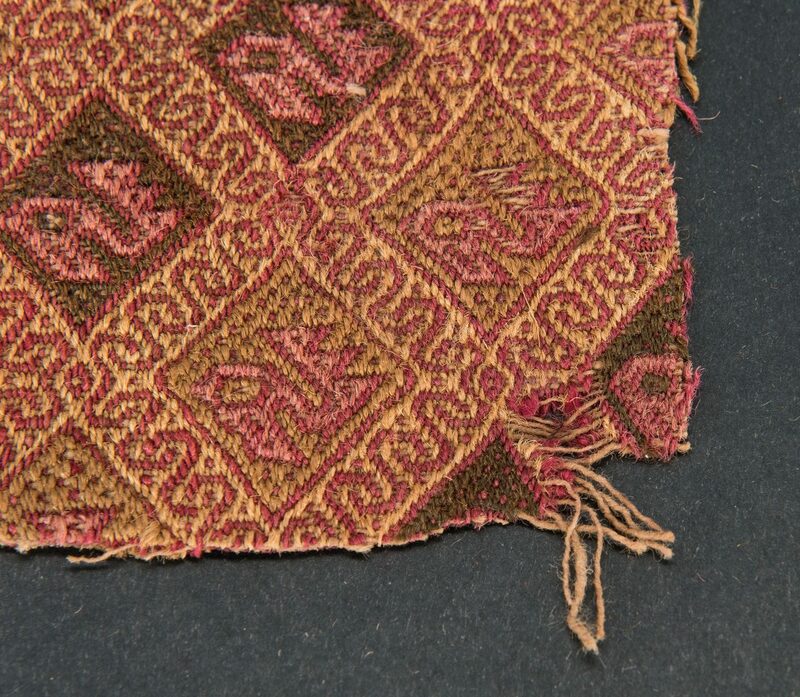 Ranging in size from 1 1/8" H x 3/4" W to 1 3/8" H x 5/8" W. 16th item: Pre-Columbian textile fragment with bird motifs surrounded by geometric patterns. 5 1/8" H x 5 1/4" W. Central Coast, 1100-1350 AD. Note: Purchased from Garden Studio, Greensboro, NC. 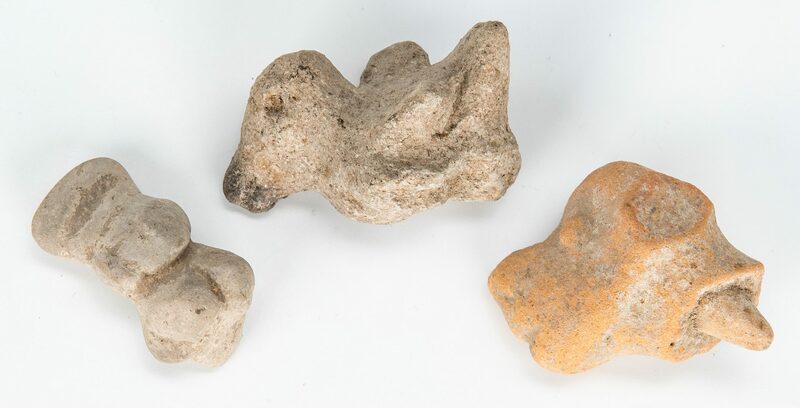 17th-19th items: Three (3) Pre-Columbian grey ware with black slip pottery beads with geometric designs to surface, rounded base, each with hole pierced through center. Ranging in size from 5/8" H x 5/8" dia. to 3/4" H x 5/8" dia. 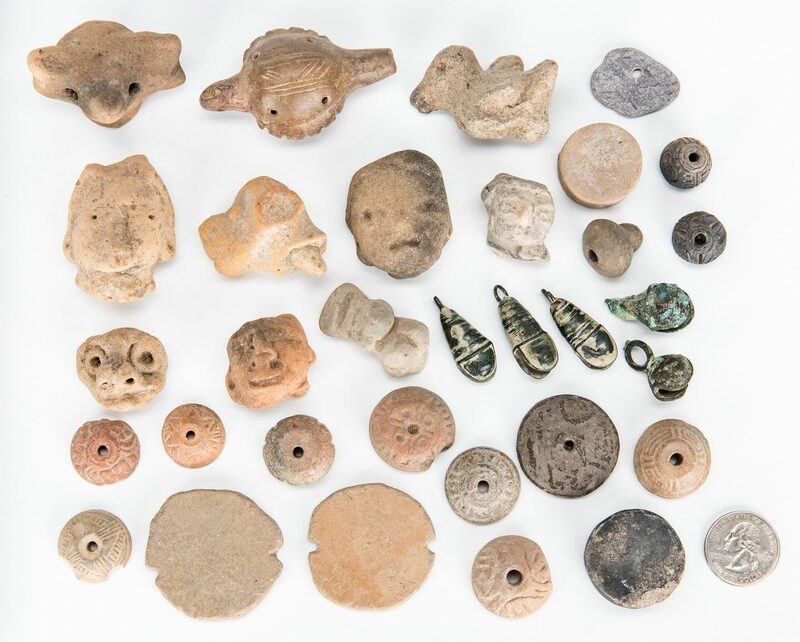 20th-28th items: Nine (9) pottery spindle whorls or beads of varying sizes with geometric designs to surface, flat bases, each with hole pierced through center. 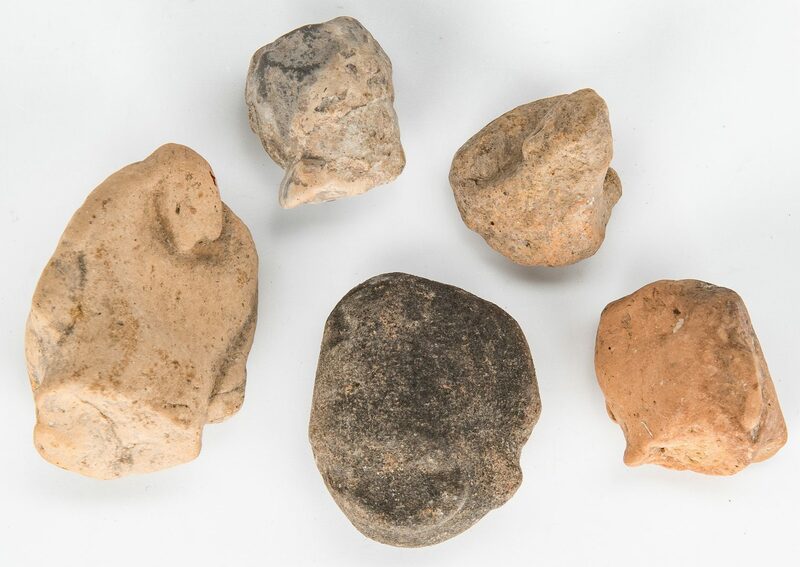 Ranging in size from 1/4" H x 3/4" dia. to 1/2" H x 1 1/4" dia. 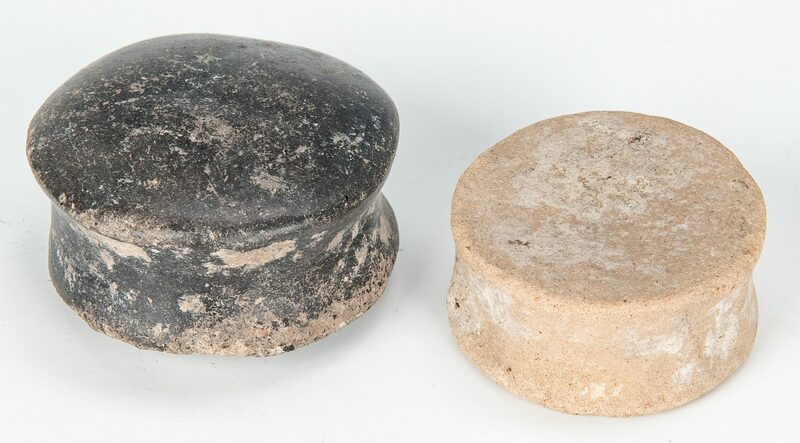 29th-30th items: Two (2) ear spools, including one (1) buff ware and one (1) grey ware with black slip. Ranging in size from 1" to 1 1/4" dia. 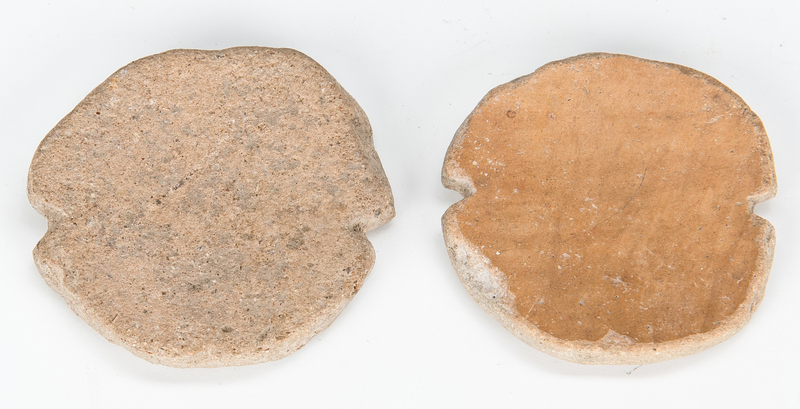 31st-32nd items: Two (2) clay binding stones or necklace pendants comprised of flat disc with one notch to left and right side. Approximately 1 7/8" dia. 33rd item: Grey stone bracelet pendant with pierced hole. 1 1/4" L. Provenance: Estate of Celia (Cece) Webb, Nashville, TN, purchased in the 1970's; a majority were purchased from the Parthenon, Nashville, Tennessee. 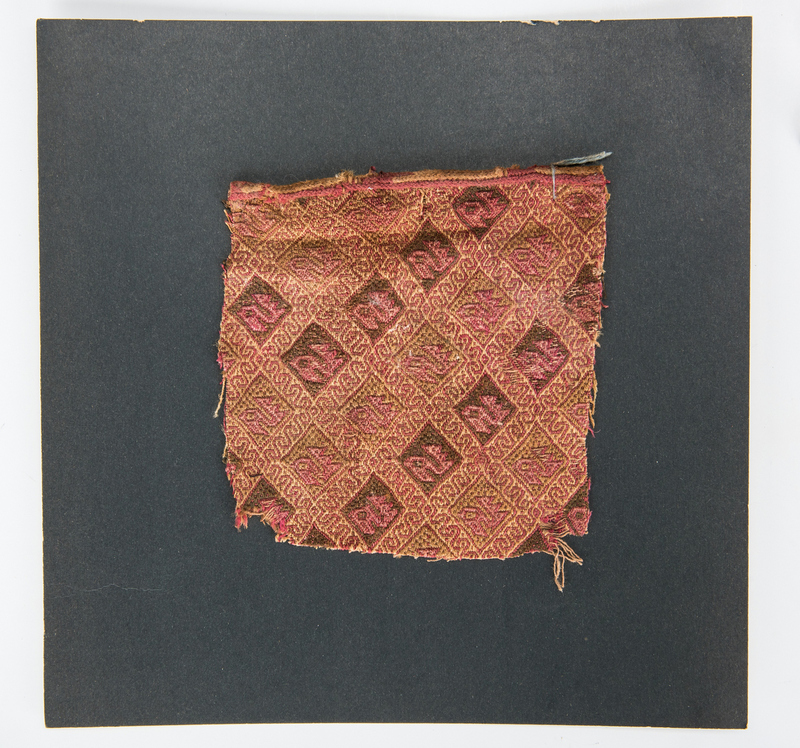 CONDITION: Overall good condition with wear, areas of loss, oxidation, to be expected from age.